There is increasing enthusiasm for evidence-based policymaking and a need for researchers to use their knowledge, research findings, and other global networks, to influence policy change to address development problems. To achieve this, researchers need to improve the way they communicate their evidence to policymakers, so that they (policymakers) understand and take up this evidence as a basis for influencing policy change. One of the ways in which researchers can communicate this evidence to policymakers is through an ‘advocacy policy brief’ which argues for a particular course of action in addressing a development issue (See FAO report here). Some scholars and practitioners assert that improved uptake of research evidence is best achieved by supporting policymakers to utilise evidence and and by making researchers more policy-sensitive (See reports here and here). 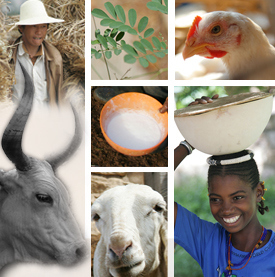 Appreciating the need to take research findings beyond the library shelves and facilitate uptake, scientists at the International Livestock Research Institute (ILRI) have been keen to produce policy briefs from their research. Lance Robinson, an environmental governance and resilience scientist at ILRI recently produced a policy brief in a collaborative process that involved working with seven selected stakeholders from the natural resource management sector in Kenya. 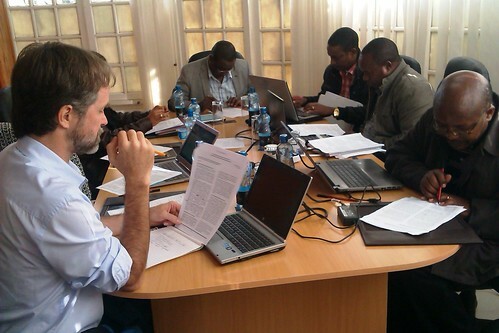 On May 29-30 2014, Robinson organised a writeshop (an intensive process that brings together relevant stakeholders to produce a publication in a very short time) with officials from Kenya’s Ministry of Environment, Water and Natural Resources, the Kenya Wildlife Service (KWS), the Kenya Forestry Research Institute (KEFRI), the Kenya Forest Service (KFS), and the National Environment Management Authority (NEMA). The result of the two-day exercise was a four-page policy brief ‘Framework for natural resource governance in dryland landscapes in Kenya: Making ecosystem-based management a reality’, that shares key policy options for governance of ecosystems in the drylands of Kenya. Evidence in the brief is based on a case study of an assessment of the ‘governance’ system for the Mt Marsabit ecosystem in northern Kenya. Governance refers to a set of social processes carried out by governments as well as other actors, networks and institutions, working individually or in combination, and is about who decides and how they decide. The study was conducted between January and August 2013. In developing the policy brief, Robinson’s strategy included getting feedback and buy-in from stakeholders in the meeting to ensure that the policy recommendations of his research are considered by the government. The document seeks to inform the on-going process of legal and institutional reform, and policymaking on natural resource governance in the country at a time when the Kenyan government is working on a new Forestry Bill. The Mt Marsabit ecosystem extends beyond reserve boundaries and includes community land. Thus, livelihood and conservation challenges are interlinked at ecosystem level, and hence can only be effectively addressed at that level. In Mt Marsabit, natural resource management and development planning are carried out along sectoral lines, which limits integration of stakeholders at community level. Community level institutions are poorly connected, based on the minimal representation of community in the district-level forums compared to the strong representation of government departments. In addition, community involvement in decision-making at higher levels than the location was weak, hence little sense of ownership of decisions. There are inadequate legislative and financial provisions to support community participation and other social functions at the ecosystem level. Using these four main issues as the basis, the policy brief gave concrete recommendations of policy options that can improve the natural resource governance in the drylands of Kenya. There are plans to later convene a forum with high level policymakers to launch/present the recommendations of the document to a wider audience. See a related article from ILRI news about communicating research findings to policymakers for policy influence. Tags: research to policy. Bookmark the permalink.